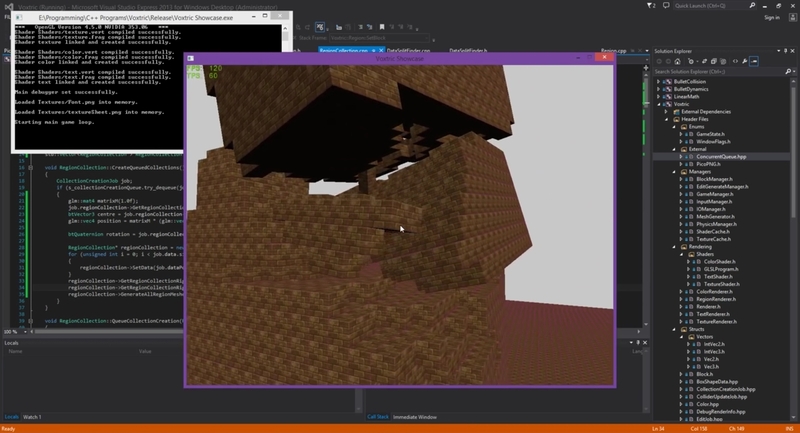 Voxtric is a voxel based game engine that I have been developing since late December 2014. However, my initial prototype was made over the summer of the same year in Unity3D. Throughout the creation of this game engine I have learnt a vast amount regarding the way that modern game engines work. This includes from how a rendering pipeline should work to how to effectively use a physics implementation such as Bullet. On top of this, I have picked up more general programming techniques for C++ such as efficient yet safe template usage. It features rendering through OpenGL and GLSL shaders as well as physics implemented in the open-source Bullet physics engine. A list of posts regarding this project and the various challenges faced an overcome throughout its development can be found bellow.